Even though the lack of a proper U.S. response was not deliberate and can be blamed on the distraction with the health care reform and just plain bureaucratic incompetence, the Russian leaders and the Russian public have a reason to wonder how badly the Obama Administration wants Russia’s support in combating terrorism and restraining Iran’s nuclear ambitions. Americans, on the other hand, should be concerned how professional and how effective is America’s public diplomacy, which aims to inform and influence public opinion abroad to make it more sympathetic to U.S. interests. The ultimate aim is to make America safer by strengthening and promoting security and democracy worldwide. Yet, few within the government bureaucracy in Washington seem to grasp that ineffective public diplomacy threatens America’s safety. Prior to 1999, a cadre of foreign service officers assigned to USIA in Washington and abroad had been responsible for crafting and coordinating U.S. responses to major international and domestic news events. Overall, they did a good job in helping to win the Cold War. During that period USIA operated separately of the State Department but was integrated into the foreign policy establishment in Washington and at U.S. embassies abroad. USIA officers knew their foreign audiences, specialized in working with local media, and made sure that whatever message the U.S. was trying to send was presented quickly and credibly using the most modern and efficient channels of communication available at the time. Many of these skills have now been lost. The case in point is the U.S. reaction to the latest terrorist attack in Russia that killed and wounded many innocent civilians. While the White House did issue a short statement of condolences from President Obama, the statement was not posted immediately on the White House or the State Department websites, where it would have been accessible to Russian media and individual web users. There was no official photograph or video to accompany the statement. It was not translated into Russian except in a brief news item posted with some delay on the Voice of America (VOA) Russian Service website. But after recent program cuts by the Broadcasting Board of Governors (BBG), which manages U.S. international broadcasting, VOA’s estimated annual reach in Russia through the Internet is only about 0.2%. VOA website is better designed and more frequently updated than the State Department websites but is still far from perfect. Another U.S.-funded broadcaster, Radio Free Europe/Radio Liberty (RFE/RL) has a superior Russian news website — more in terms of design than content — but it does not specialize in American news and faces other problems, such as American management’s discrimination against foreign-born journalists and intimidation of its reporters in Russia by the Kremlin’s secret police. There was no mention Monday of the terrorist attack or the U.S. reaction to it on the official State Department Blog, the U.S. Embassy Moscow website or the Open America website created by the Embassy in Moscow to communicate with the Russian public. There was also nothing posted about this tragic incident on the Russian-language America.gov website edited in Washington by the State Department’s public diplomacy team. This website is notoriously late in posting news-related U.S. government statements and articles. Not that the web team at the White House has done a much better job as far as Russia is concerned. It took the White House 10 days to post a video from President Obama’s trip to Russia. The video, produced in the style of early Cold War propaganda newsreels, was already overtaken by other events when it was posted ten days after President Obama’s visit, and there was no Russian translation to accompany the images. It was not posted on the U.S. Embassy Moscow website. His last point is certainly worth pondering. The U.S. Ambassador to Russia, John Beyrle, a career diplomat who speaks fluent Russian, has made good attempts to communicate directly with the Russian people through radio and television interviews, but the Kremlin controls access to those television and radio networks which enjoy the highest ratings because of their nation-wide coverage. Ambassador Beyrle also has his own blog, in which he makes use of video and his Russian-language skills. Compared to the official State Department Blog, which has little useful information and even less analysis, in addition to relying heavily on AP images — which are not in public domain — his blog is far more informative and focused. Whether or not Evgeny Morozov is right that the benefits of the Internet for official public diplomacy are to some degree utopian, U.S. taxpayers deserve that their money used for their government’s efforts of communicating with foreign audiences be wisely spent. Even if U.S. diplomats are ill-equipped to take advantage of the new social media, they can still use the Internet to present and explain foreign policy questions. But U.S. Embassy and State Department websites and blogs are not only poorly designed, they are also infrequently updated and rarely offer public domain photographs and other useful materials. Foreign journalists cannot rely on them for timely and objective information, in-depth analysis, and free resources, such as ready-for-posting photo images and broadcast quality video and audio. They can also no longer rely for the same on the Voice of America. The Broadcasting Board of Governors, which was created when USIA was dismantled, eliminated VOA Russian-language radio broadcasts just 12 days before the Russian military attack on Georgia last summer. The BBG denied VOA resources to serve as a multimedia source of comprehensive information about U.S-Russian relations and American society and did not protect the VOA website from cyber attacks. During President Obama’s official visit to Moscow, the VOA website was out of commission for at least two full days. Instead of demanding that the Russian security services stop threatening radio and TV stations using VOA news programs and that the Russian authorities should treat VOA the same way the Russian state broadcasters Radio Russia and Russia Today TV are treated in the U.S., where they are free to place their programs on cable and individual stations, the BBG responded to the secret police intimidation by eliminating on-air VOA radio and TV broadcasts. 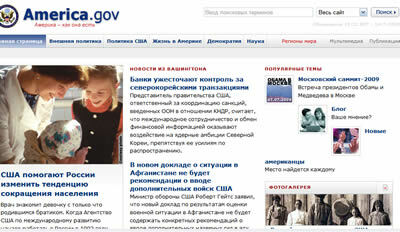 An NGO website, GovoritAmerika.us, launched in 2008, edited by volunteers and not connected with the U.S. government, offers now the only one-source access with direct links to both U.S. government and non-government U.S.-Russia-related news materials, but the website receives no public funding, which prevents it from expanding its coverage. Not all of Vice President Biden’s comments were ill-advised from the public diplomacy perspective. Robert Amsterdam, an international lawyer who represents Russian businessman Mikhail Khodorkovsky, an imprisoned political foe of Prime Minister Putin, wrote in a recent article in the Huffington Post that by “creating manageable confrontations, especially with Europe, the United States, and the former Soviet states, the Kremlin is attempting to govern outwardly, diminishing pressures for greater accountability in their domestic shortcomings, and helping to stir up nationalism and support for the regime.” Under these circumstances, communicating with the Kremlin and the Russian public requires a great deal of sophistication. All of this calls for a quick overhaul of U.S. public diplomacy. 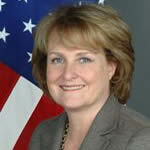 The State Department has a new public diplomacy chief, Under Secretary Judith McHale — her predecessor, James K. Glassman, appointed by the Bush White House, terminated VOA Russian radio and TV in his previous position as the BBG chairman — but there still is no Obama Administration plan and no structure to that would help the U.S. to respond with a coherent and well-delivered message to such developments as the recent terrorist attack in Russia, the Kremlin’s threats against Georgia and Ukraine, or the Russian media’s reaction to Vice President Biden’s Wall Street Journal interview. Concerned by these shortcomings, several members of Congress, including Senator Richard Lugar (R-Indiana), are trying to revive support and funding for professionally conducted U.S. public diplomacy. 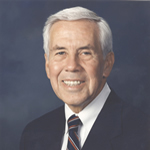 Senator Lugar introduced S. Res. 49 on February 13, 2009, expressing the sense of the Senate regarding the importance of public diplomacy. He also wrote an oped for ForeignPolicy.com on this topic. Another U.S. Senator, Sam Brownback (R-Kansas), has called for abolishing the Broadcasting Board of Governors. 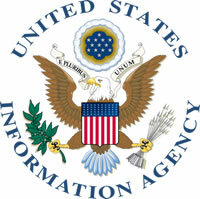 He introduced legislation that would establish the National Center for Strategic Communications, an agency similar to the now defunct U.S. Information Agency. Senator Patrick Leahy (D -Vermont) has tried to stop the BBG from eliminating U.S. broadcasts in foreign languages but his efforts have been ignored by most of the Board members and their executive staff. Only one BBG member, Blanquita Walsh Cullum — the only journalist serving on the Board — opposed cuts in U.S.-funded broadcasting to Russia and other media-at-risk countries. Whether these and other calls for reforming U.S. public diplomacy and international broadcasting will be answered and result in meaningful legislative changes will depend on the cooperation from the Obama White House. New media, international broadcasting, and public diplomacy cannot solve all the problems the U.S. is facing abroad, but a little bit of expertise in these areas and good management can be very helpful. Otherwise, pro-democracy activists and authoritarian regimes will continue to wonder what the Obama Administration wants and what it can do. It would help if the Administration could agree on what that message should be and how it should be delivered. 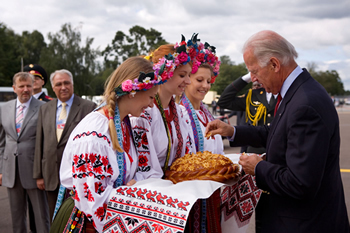 The Russians may conveniently assume that Vice President Biden’s unfortunate comments about their country’s second-rate status were deliberate, and may think the same about the non-response in Washington to the terrorist attack in Ingushetia. But as someone who has observed the U.S. foreign policy establishment first-hand, I can say that most of it can be blamed on carelessness, incompetence, and the simple fact that most of the State Department and U.S. diplomats based abroad are on vacation in August. But in addition to that, the structural problems of U.S. public diplomacy are real and demand immediate attention from the Obama Administration and the U.S. Congress. 1 user commented in " US Public Diplomacy Failure to Reach Out to the Russians After Terrorist Attack in Ingushetia "
WHO MADE AMERICAN RFE/RL ANTI-AMERICAN? As Ted Lipien points correctly, RFE/RL “faces…problems, such as American management’s discrimination against foreign-born journalists”. But, being quite correct, it is still an understatement. “Lawsuits against RFE/RL brought in Czech courts by Anna Karapetian and Snjezana Pelivan received an unprecedented media echo – in Russian, English, Czech, Armenian, Serbo-Croatian. The list of negative media publications is virtually endless. Here are some headlines, to mention but a few: “Czech Sovereignty Ends at RFE/RL”, “Free Europe With Its Own Laws in Colonial Czech Republic?”, “Radio Liberty Betrays its Ideals”, “Radio Free Europe – Guantanamo in Prague”, “Equality With Precondition. Practice of Free Europe Contradicts Its Ideals”, “From Human Rights Show to Human Rights Court”, “Public Disaster Instead of Public Diplomacy”, “Prague Spring of 2009 Leads to Strasbourg”, “U.S. Attorney General is Asked to Investigate Fraud at RFE/RL”, “Doomsday of Radio Liberty. From Double Standards to Double Morals?”, “New Administration Must Undo RFE/RL Anti-Diplomacy Abroad”, “BBG, RFE/RL: Bring Public Diplomats Instead of Public Bureaucrats”, “Don’t Feed Kremlin’s Public Diplomacy With U.S. Public Hypocrisy”, “A Sense of Betrayal”, etc. There is no question that the headlines quoted by Armenian newspaper represent a ready-made blueprint for Obama’s corrective public diplomacy agenda. There is a question, however, if such a hands-on agenda exists there at all – beyond pompous, if well-meant, pronouncements.